Photograph of a group of Jewish refugees at a luncheon table in Czechoslovakia. "Wide World Photo | Please watch credit | 894883 | Czechoslovakia aids political refugees | Bruenn, Czechoslovakia. One of the groups photographed at the luncheon table in the camp established here for political refugees from Germany and Austria. (See pictures 894880 for further details and pictures 894881/2/4 for other camp scenes). T-7/25/38 (s) Ernst" -- typed note attached to verso. "Received. Examiner reference library. 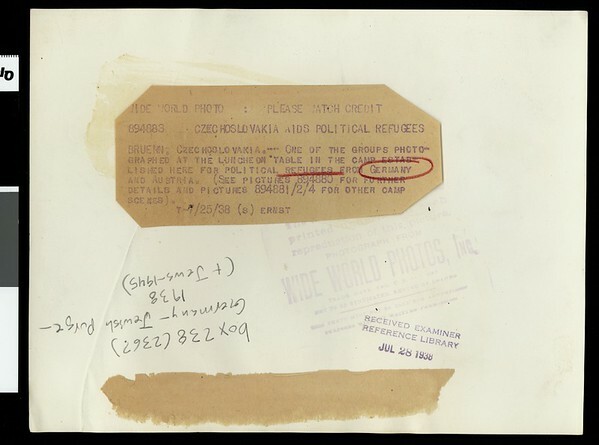 Jul 28, 1938" -- stamped on verso.